Maccabi Electra bounced back from an awful game 1 to stun defending champion Panathinaikos 92-94 on Thursday at OAKA to even their best-of-five Turkish Airlines Euroleague Playoffs series at 1-1. David Blu connected on two clutch three-pointers in the last two minutes of overtime – the first to tie the score and the second to put Maccabi ahead with 29.8 seconds left – and the team denied the Greens twice on the final possession to secure the win. Keith Langford paced the winners with 17 points, Blu scored 16, Yogev Ohayon came through with a career-high 15 points plus 5 assists and Devin Smith tallied 15 plus 9 rebounds. After a close first half, Ohayon led the visitors on a 0-9 third-quarter run to make it 54-61. A Devin Smith triple early in the fourth quarter gave the Israeli champs a 10-point lead and stunned the local crowd. 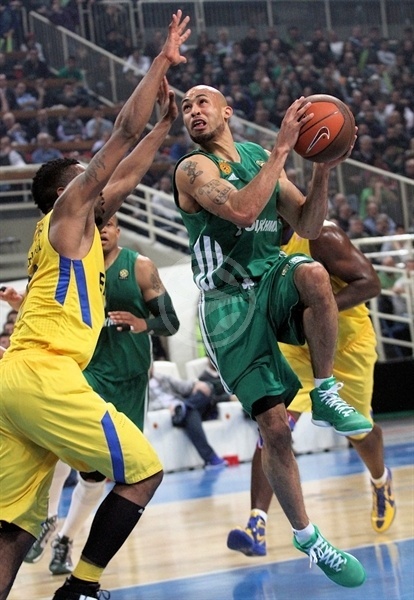 However Panathinaikos roared back through fantastic three-point shooting to set up an exciting finish. Kostas Kaimakoglou tied the game with 13.2 second left in regulation and Maccabi did not get off a shot before the buzzer, which meant overtime. Once there, the hosts jumper ahead, but Blu’s shooting paved the way and Maccabi held on for a valuable win in the end. Kaimakoglou led Panathinaikos with 20 points, Mike Batiste produced 16 points, 9 rebounds and 6 assists, Sarunas Jasikevicus scored 15 and Kostas Tsartsaris and Dimitris Diamantidis added 12 each. Diamantidis also dished 6 assists. Panathinaikos dominated the tempo early. Steven Smith opened fire with a three, but Richard Hendrix soon replied with a slam, letting the Greens know that Maccabi was in the house. Lior Eliyahu managed to score to tie the game at 4-4, but then Diamantidis appeared. With two almost consecutive threes, he managed to make it 10-6 to which Aleks Maric added a free throw. Maccabi was not able to run at this point and rotations started, which Devin Smith used for a three that kept the guests close enough. Blu and Sofoklis Schortsanitis, who was starting to stand out in the paint, managed for a 0-4 run that tied the game at 13-13 and caused a Panathinaikos timeout. The hosts had a little struggle from the free throw line, but Batiste appeared to put the Greens ahead 18-15. However, Shawn James stepped on court for a three-point play that tied the game at 18-18. The quarter was drawing to a close and then Tsartsaris stepped up with back-to-back threes - for a total 5 for Panathinaikos in the quarter - to control the clock until the final buzzer and leave it at 24-20 after 10 minutes. Blu opened the second quarter with a baseline jumper and after Tsartsaris finally missed from downtown, a Theo Papaloukas turnover turned into a Nick Calathes triple. Then David Logan showed off his skills with a jumper to extend the difference to 29-22. 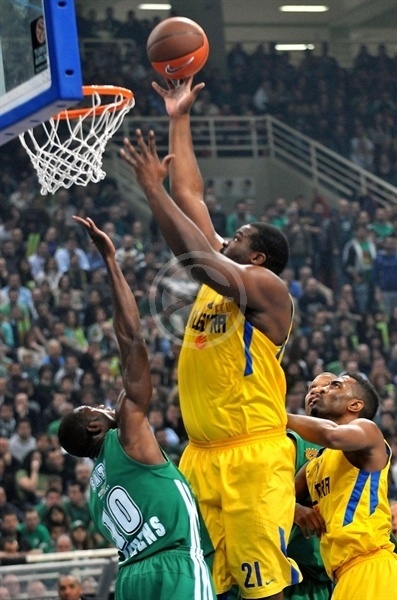 Ohayon managed to get a basket back only to see Diamantidis feed Ian Vougioukas for a score. 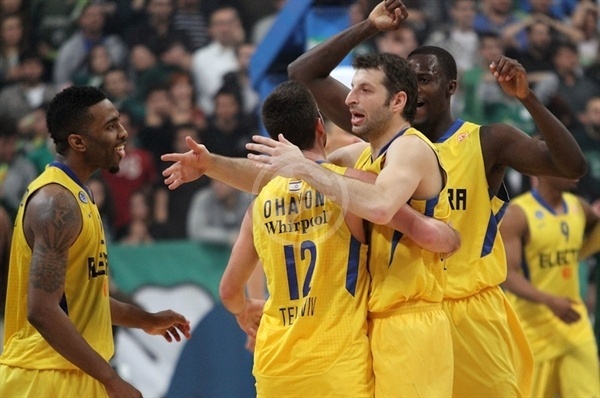 Blu struck again and Schortsanitis spun for a bucket as Maccabi worked its way back. Devin Smith tacked on 2 from the line to make it 31-30. 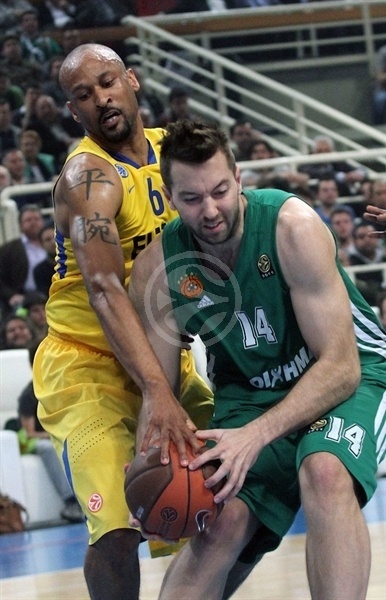 Jasikevicius briefly gave the Greens some breathing room with a triple only for Big Sofo to score again. 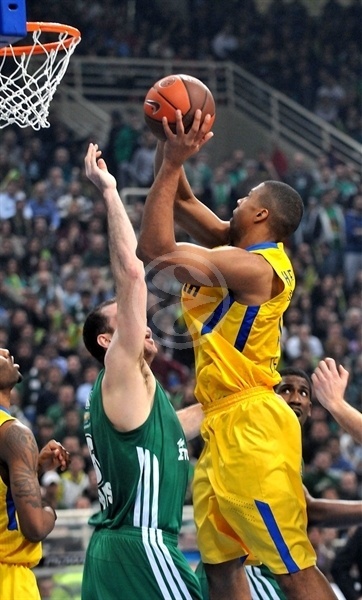 Then Langford silenced the arena with a as he carved through the Panathinaikos defense to knot the game at 34-34. Saras ht back with a jumper, but after a timeout, James did the same. Batiste brought about a round of cheers with an offensive rebound and a two-handed jam, but then Maccabi went ahead 38-39 on an Ohayon triple. Maccabi’s good run continued with Ohayon to Blu on the break, which led to a Panathinaikos timeout. The hosts’ defense increased their intensity and Panathinaikos grabbed the lead through Kaimakoglou, who scored a layup and a triple, which left the home team with a 43-41 halftime advantage. Maccabi drew a pair of early fouls and regained the lead on a three-point play from Ohayon. However Schortsanitis committed two fouls over the next minute and took a seat with 4. Kaimakoglou continued a great night with a dunk and 2 free throws to lift the Greens to 49-46. Maccabi answered back with a Richard Hendrix slam and a Langford layup on the break. Kaimakoglou drilled a triple, but Langford went hard to the rim to tie the score at 52-52 midway through the third quarter. Vougioukas free throws were met by a lucky Hendrix hook to beat the shot clock. Ohayon sacrificed his body on a drive to put the Israeli champs ahead. The playmaker then picked off a Panathinaikos pass and darted to the hoop for a bucket before Devin Smith drilled a three to make it 54-61. Tsartsaris ended the Panathinaikos drought with 2 from the line and then cut to the basket for a lefty layup for a 58-61 score through three quarters. 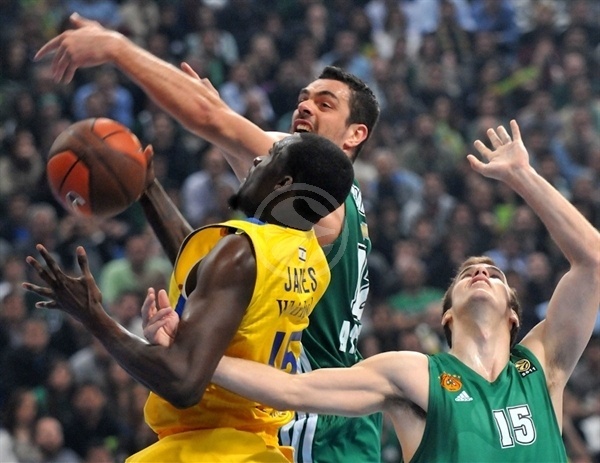 Maccabi slowed it down and managed to draw three quick fouls from the Panathinaikos defenders. Hendrix took advantage with 2 free throws, then Langford scored with a tip-in and Devin Smith struck from behind the arc to give Maccabi a 58-68 lead at a very quiet OAKA. Playoffs Game 1 MVP Diamantidis came off a timeout to nail a triple. Schortsanitis attacked the rim for a massive slam at the other end, but then committed his fifth foul and was done for the night with 6:48 remaining. Diamantidis’s fourth three-pointer of the night closed the gap to 6. Ohayon continued a superb game with a big three-pointer, 64-73, midway through the fourth quarter. Jasikevicius hit back with a triple that got the local fans singing. Langford answered back with a basket-plus-foul – though he missed the free throw. A Kaimakoglou three then narrowed the deficit to 70-75. And Saras hit another from downtown for 73-76. Sato then made it a 1-point game from the line. Papaloukas and Saras traded baskets. Then Papaloukas flipped in another score. Batiste sank 2 free throws to make it 79-80 with 1:34 remaining. Papaloukas split free throws at the other end. Diamantidis chewed up the Maccabi defense and made a perfect pass to Batiste for a dunk to knot the score at 81-81 with a 1:10 to go. After a timeout, Blu drained a three with a foot on the three-point line and Papaloukas forced Batiste into a travel in the paint. Diamantidis rescued the hosts with a blocked shot and Kaimakoglou went to the line with 13.2 seconds remaining and sank both free throws to tie the game at 83-83. A busted Maccabi play ended with Langford making a desperate jumper, but it was after the buzzer and the game went to overtime. Jasikevicius scored the first points of the extra session from the line. Hendrix fouled out and then Kaimakoglou made it 86-83. Devin Smith scored Maccabi’s first points of overtime after 90 seconds of play. Batiste countered with free throws. Langford clawed the visitors within 88-87 with 2:16 remaining. Diamantidis passed to Batiste off the glass for a nifty slam, but Blu bettered them both with a long three-pointer to tie it at 90-90. 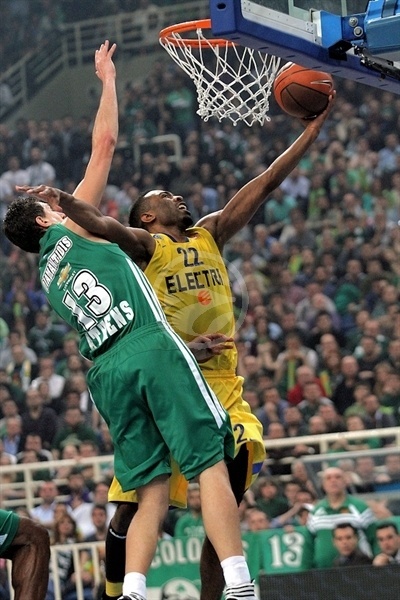 Panathinaikos went back to Batiste, who used his size to sink a short jumper. Blu put the pressure back on the Greens with a three to put Maccabi up 92-93 with 29.8 seconds left. Saras went for a quick jumper, missed, and Maccabi got the rebound. The Greens sent Langford to the line, but he split free throws with 18.3 seconds remaining. Panathinaikos had one last chance, but Diamantidis missed from three, then Saras missed from two and Maccabi raced off the court with the win. 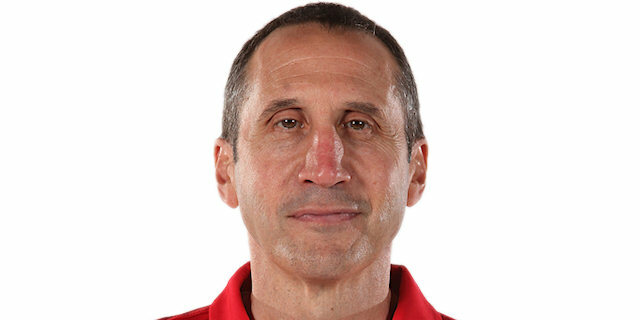 "Two days ago, I stated here that Game 2 should be much different and you saw what happened tonight. We lacked energy and didn't play the same way. If you don't put pressure on your opponent, they will score and in such a case you pay for the lack of concentration. Individually and as a team we have the experience needed to react and fight. We paid for our mistakes and this is the reason we lost. I don't think that Maccabi improved its game, but they showed their team character. However it is hard to play two games of that level in 48 hours. " "Ιt was a great, an unbelievable game. The spectators saw tonight what they expect to see in a basketball game. Great players, big shots, comebacks, ups and downs. Both teams could have won the game and I am proud because we finally did it. On Tuesday I said that we need to improve our rebounding and ball handling. We returned tonight better prepared and with a great desire. David Blu made two big shots in the last seconds and sealed the victory. I have to mention Yogev Ohayon, who had a great game too. 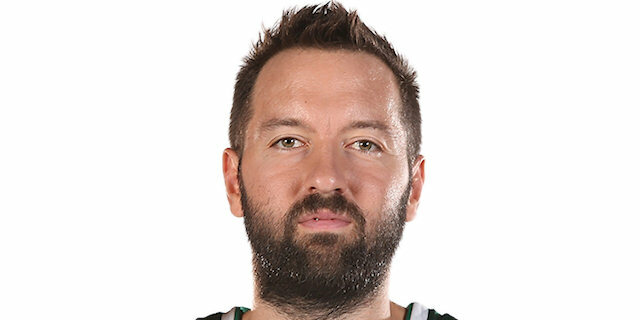 You probably don't know him, he is a Euroleague rookie and he is not famous outside the country, but he deserves a lot of credit for everything he has done. 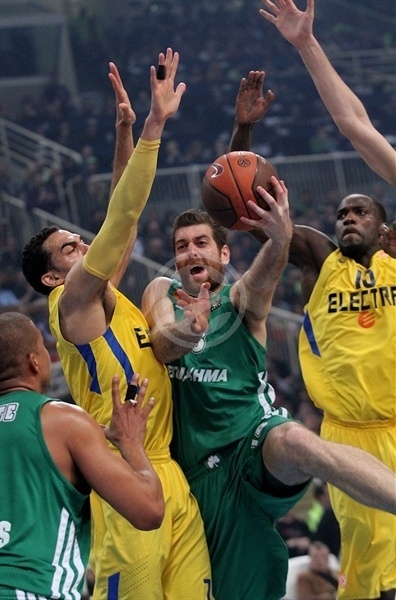 In the first game I knew that we had a mission impossible and I decided to use some tricks just to bother Panathinaikos. Today it was much different. I was sure that we could do it. Call it inspiration or whatever. We played a tactical game and it worked. We tied the series, but this doesn't mean anything yet. We have to go back and see what we can do against a great team and a great coach." 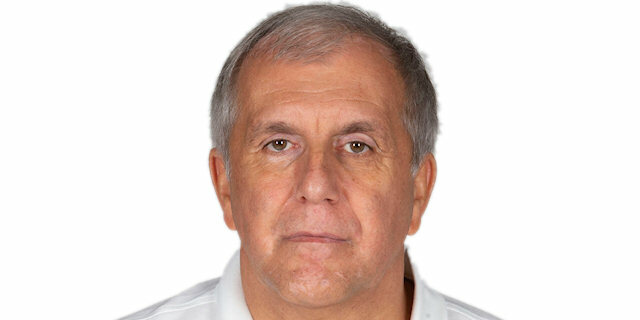 "We expected that Maccabi would put more pressure on is compared to the first game. We made a lot of defensive mistakes during the regulation and hasty shots in the overtime. The problem was that we didn't read correctly their defense. It is always difficult to play in their court, but we will try hard to win at least one game there. The ideal is to win the first one, on Tuesday."